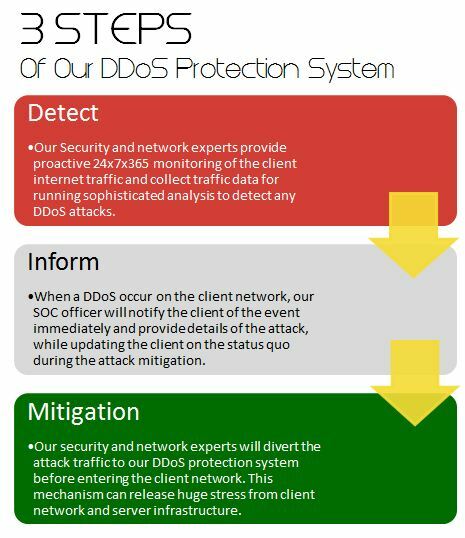 A new study reveals, Distributed denial of service (DDoS) attacks against financial service firms increased by 25% during the first quarter of 2012. China (30.59% of attacks), the U.S. (19.20%) and the Russian Federation (13.4%) are currently the top three source countries of DDoS attacks, the survey says. The other 7 source countries in the top 10 are India (9.52%), Germany (7.30%), France (4.66%), Korea (4.53%), Ukraine (3.91%), U.K. (3.60%) and Brazil (3.28%). DDoS attacks are getting bigger and more complex. Black-hole simply is not solution. With limited bandwidth and sophistication, the traditional firewall, IDS/IPS devices can no longer mitigate or prevent today’s multi-vector DoS and DDoS attacks. Once the volumetric attack enters the line, it will consume the entire bandwidth and leaving no spare for legitimate users. As a result, the system and communications are paralyzed. How does ACME selected DDoS protection work?